When the whistle blows at exactly 4:30 p.m. tonight this little market will begin accepting EBT (electronic benefit transfer for SNAP fka food stamps). All morning Libby Smythe’s phone has been ringing. Libby is a member of the non-profit sponsor of this market Wahiawa Community Based Development Organization, the farmers market director and contact person for the market. Coming one after the other, the calls have been people expressing their thanks to the market for opening up their market to include EBT beneficiaries. Dan and Kasha sent out the media release to announce the launch of this service this Monday morning, the immediate response and deep support for this effort by our local journalists is a telling indicator of just how clear the need is and just how much we care as a community for one another. Here’s a link to an article by Erika Engle and an interview with HPR’s Noe Tanigawa. On the ground in Wahiawa, the flyer Dan created are being distributed to the far reaches. Jackie Akuna, Ag teacher at Leilehua High School and farmers market vendor, made sure that flyers got to all the teachers and students. We’re thinking now we better round up some parking lot volunteers. Wahiawa is the first farmers market chosen by GreenWheel Food Hub in strategic effort to bring EBT service into Oahu farmers markets that are located in areas of need and have committed to a 100% locally grown produce policy. We all feel it is an honor to be working with the citizens of Wahiawa, this old town with ancient agricultural roots. Wahiawa has witnessed the fall of agriculture in Hawaii and has been significantly impacted and transformed by it. It’s a hardworking community now wracked by unemployment, a large and growing senior population, and apartment complexes once taken up by military families now house families recently arrived, economic and health refugees from Pacific islands. There’s a lot going on in Wahiawa and it’s a good thing that there’s strong and active leadership in this community. I’m a co-founder of both She Grows Food and GreenWheel Food Hub so you will be hearing a lot about GreenWheel Food Hub here at She Grows Food. She Grows Food has fostered the development of GreenWheel Food Hub from the time it was a little seed in the mind of myself and Chef Gida Snyder during our talks after the KCC Farmers’ Market where she was a vendor and I am still a manager. Both She Grows Food and GreenWheel Food Hub share the goal of repair and regeneration of our local food systems. They also share a profound love of down home community can-do spirit and care, ono food and all that goes into growing good food. I see this in everyone involved in these two individual yet deeply connected efforts – Dan, Linda, Jesi, Rob, Gida, Kasha, Nan. I see the same sparkle in our partners in these efforts too. There are many people who came in to help make this happen at Wahiawa and who have offered their support to insure this service continues. The Island Innovation Fund and Hawaii Community Foundation have committed to supporting GreenWheel Food Hub’s effort to bring EBT into five Oahu Farmers’ Market over the next year, Wahiawa is the first. 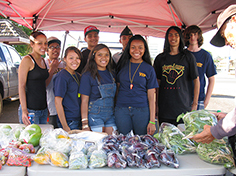 Kaiser Permanente and Kanu Hawaii, partnered for an initiative that focuses on supporting neighborhoods experiencing food desert situations, they are helping to cover costs for EBT at this market. Just this past weekend, InterIsland Terminal hosted an event in collaboration with Mission Street Food, The Whole Ox Deli and Prima that focused on a sharing of ideas about food, charitable businesses, and community building. Proceeds from this event are also going to GreenWheel Food Hub to help with Wahiawa Farmers’ Market EBT service and outreach. Yes, we’re excited. I’m recharging the batteries for my trusty canon hd and am going to try and eke out a long night to edit scenes from tonight’s market for you. Dan and I are hopeful that we are seeing in all of the energy surrounding this choice of inclusion at this little neighborhood market is a turning point of some sort. A visible point of reference that underscores and illuminates an instinct towards wholeness. Yes, no one gets left behind. Thank you for all of your help in publicizing our Wahiawa Market!